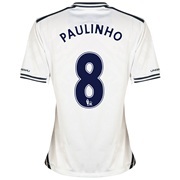 All your classic Tottenham shirts from the old days. Tottenham 1940's - 1950's away. Tottenham 1977 - 1980 away. Tottenham 1981 FA Cup Final. Tottenham 1982 - 1983 away. Tottenham 1982 - 1983 home. Tottenham 1982 F.A. Cup Final. Tottenham 1984 UEFA Cup Final. Tottenham Hotspur v Chelsea 1967 FA Cup Final DVD. Tottenham Hotspur v QPR 1982 FA Cup Final DVD.